The new docking station from Targus extends e.g. laptops via USB-C by a whole series of interfaces. Its very special feature are the four HDMI ports, via which either four monitors with FullHD resolution (1,920 x 1,080 at 60 Hz) or two displays with 2,560 x 1,440 pixels (and up to 50 Hz) can be addressed. 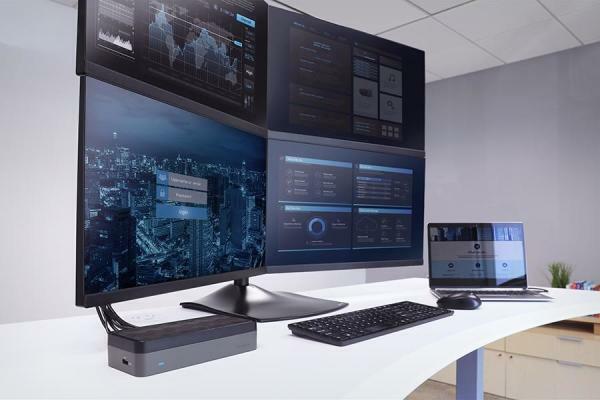 In addition, the Targus QuadHD Docking Station (DOCK520USZ) offers four USB 3.0 ports (one with fast charging), a Gigabit port and a 3.5mm audio in/out port. It is connected to a PC via USB-C (USB 3.1 Gen 1) - but can also be connected to a notebook via Thunderbolt 3, because the same USB-C port as for USB 3.1 Gen 1 is used and Thunderbolt 3 is more powerful but also backward compatible to USB 3.1. The Targus QuadHD Docking Station has a rubberized bottom and can be mounted on the back of a monitor using the optional VESA mount. It works together with PCs, Macs, Linux and Chromebooks PCs and Android devices - it supports Windows (10/8.1/7), Mac OS X (10.12/10.11/10.10), Android (5.0 or later), Chrome (R51 or later) and Ubuntu Linux. The docking station costs around 270 dollars (240 euros).